As one of top companies in South Florida for Junk Removal, XS Trash continues to surpass the competition with our ability to handle all jobs, both large and small. We provide the ability to set your pickup schedule, with same day pickup by special request. We offer not only South Florida Junk Removal removal and disposal, but also recycling of all eligible materials, leaving you free from worry over the negative impact of trash going into a landfill. Our jobs are carried out by our skilled team who will load and remove the debris and junk from your job site, leaving you free to handle other parts of the project. Providing South Florida with Junk Removal Services, XS Trash has developed a reputation for providing the same high quality service to customers regardless of job size. Whether a small amount that only needs one truck, or a large junk and removal project, our fleet can handle jobs of any size, often clearing sites in as little as one load! Serving our clients with year's worth of affordable services, you can count on consistent service year after year. Proud to provide South Florida with Junk Removal as one of the most dependable and comprehensive providers in the area, the team at XS Trash is dedicated to 100% customer satisfaction. Licensed & Insured Miami, Broward and Palm Beach Counties Junk Removal Waste Removal & Junk Pickup & Hauling. 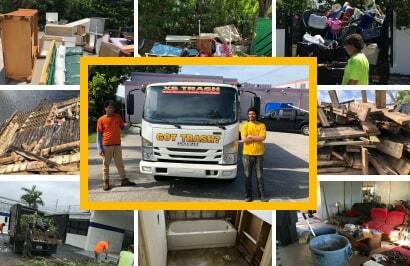 XS Trash is a full-service company providing: South Florida Junk Removal, trash removal, junk pickup, foreclosure clean out, junk hoarding, furniture removal, appliance removal and demolition clean out, for residential and commercial properties.